Type 2 diabetes is the most common form of diabetes mellitus, a disease marked by abnormally high blood glucose levels. In particular, people with Type 2 diabetes have a condition called insulin resistance, where the body does not use insulin properly to transport glucose into cells for energy. The body, at first, will produce more insulin to compensate, but over time, it will not be enough to stay blood glucose at normal levels. 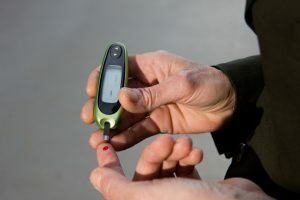 In the U.S., at least one in ten people are diagnosed with diabetes – with 95 percent of all cases being Type 2 diabetes. The condition is often seen in people over 45 years, but the latest trends have seen development as early as children, teens, and young adults. For the most part, Type 2 diabetes can happen at any age; although, this is often diagnosed in middle-aged and older adults. Aside from age, people with a family history of diabetes, as well as those who are overweight and obese, are also more likely to develop the condition. In terms of ethnicity, the disease is common in African Americans, Hispanics, American Indians, Asian Americans, and Pacific Islanders. Those with a sedentary lifestyle and those with existing health problems like hypertension are also at risk of having Type 2 diabetes. If a person has been diagnosed with prediabetes, where his blood sugar is high but not enough to be classified as diabetes, his chances of it developing into Type 2 diabetes are also increased. The same goes for women who had gestational diabetes during her pregnancy. Type 2 diabetes can develop slowly, and some people may not even display symptoms until complications occur. Cardiovascular disease. This includes coronary heart disease, heart attacks, stroke, atherosclerosis, and hypertension. Neuropathy. This occurs when the capillaries that provide oxygen-rich blood to the nerves, especially the legs, are damaged. If it affects the digestive tract, it can result in nausea, vomiting, diarrhea or constipation. In men, Type 2 diabetes can cause erectile dysfunction. Nephropathy. Severe damage from diabetes can lead to end-stage kidney disease and kidney failure. Eye damage. If the blood vessels of the eye are damaged, this can possibly lead to blindness or other severe conditions like glaucoma. Foot damage. Once diabetes damages the nerves or the blood vessels in the foot, this can lead to serious infections which heal poorly. Alzheimer’s disease. The exact connection is unclear, but experts have suggested that poor sugar control increases the risk of Alzheimer’s disease. A person’s diet can greatly impact his likelihood of getting Type 2 diabetes – if he eats unhealthy food items, he increases his risk; if he maintains a healthy diet, then his risk is greatly decreased. However, this does not mean that a person gives up sweets entirely or eats flavorless food for the rest of his life: An important aspect of diet is paying attention to certain food choices, especially carbohydrates. Following some diets, such as the Mediterranean diet, can help manage this. Losing weight, together with healthy food choices, can significantly reduce the risk of diabetes. In addition to a healthy diet, an increased physical activity also reduces the likelihood of getting the disease, even if you already have prediabetes or have a family history of diabetes. To note, a person should aim for 30 minutes of moderate physical activity in a day. Some examples include brisk walking, bike riding, and swimming. Overweight people who lose at least seven percent of their body weight can greatly reduce their risk of diabetes. It also develops a healthier heart, more energy, and improved self-esteem. Type 2 diabetes is the most common form of diabetes mellitus. People with Type 2 diabetes have a condition called insulin resistance, where the body does not use insulin properly to transport glucose into cells for energy. In the U.S., 95 percent of all diabetes cases are Type 2 diabetes. Type 2 diabetes is often seen in people over 45 years, but the latest trends have seen development as early as children, teens, and young adults. Type 2 diabetes may seem asymptomatic at first, but it can lead to multiple organ damage, as well as disability and even death. Losing weight, together with healthy food choices, can significantly reduce the risk of Type 2 diabetes.